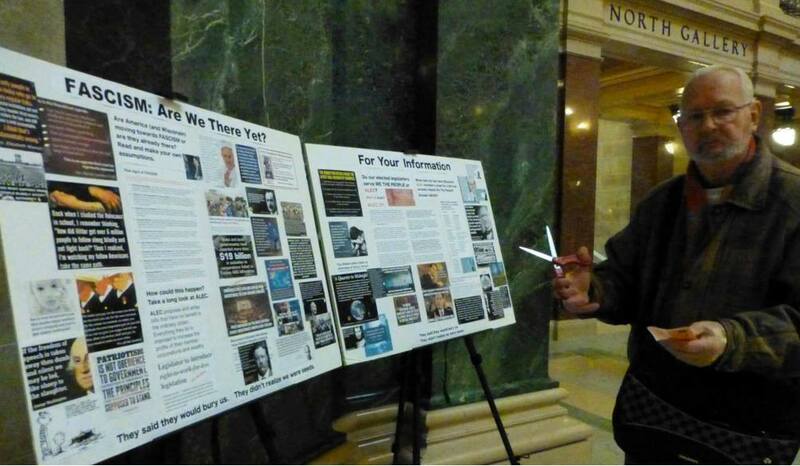 Questions remain in the wake of state Rep. Dale Kooyenga’s admission he illegally removed a 40-by-30-inch sign in late May from the Wisconsin Capitol rotunda and wasn’t charged. 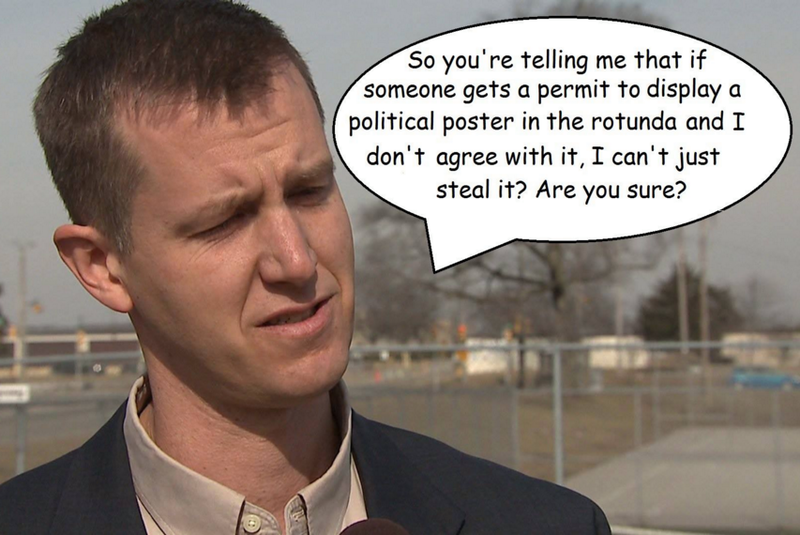 Did the Brookfield Republican get a pass because he’s a legislator? Why won’t the Department of Administration release the video that shows him taking the sign when it has turned over such videos in the past? Aspects of his statements to police and the media appear to skeptics to show either extreme naiveté or intent to deceive, yet there has been no follow-up. Now comes the revelation that Kooyenga was convicted in 2000 in Sheboygan in a case involving physical assault of a minor that was eventually amended from a criminal misdemeanor charge to noncriminal disorderly conduct. The two then returned to Kooyenga’s party, which is when the marijuana smoking occurred on the second-story porch balcony and the 17-year-old nearly fell off when Kooyenga again tackled him, the complaint states. “He said he was never physical back towards Dale,” it says. Kooyenga told police that the boy was supposed to be going to a religious retreat in Indiana but had told his parents, who were in Europe, that he had missed the bus. The 6-foot-7 Kooyenga graduated that year from Lakeland College, where he’d been recruited to play basketball after graduating from Chicago Christian School and attending Moraine Valley Community College in Palos Heights, Ill.
A complaint for Class B misdemeanor disorderly conduct, maximum punishment 90 days in jail and a $1,000 fine, was filed July 25 in circuit court. The prosecutor later amended the charge and Kooyenga pleaded no contest Aug. 23 to noncriminal disorderly conduct with court costs and forfeiture (fine) totaling $181.25. According to James Murray, a Madison criminal defense attorney, court documents “show that Dale Kooyenga caught two big breaks in 2000. The first was when they charged Mr. Kooyenga with the misdemeanor crime of disorderly conduct as opposed to a much more serious felony offense like physical abuse of a child, since the alleged victim was 17 and still a minor. A copy of the display permit for May 8 to June 6 was attached to the back of the sign, which was placed on an easel. Johnson wonders why a four-term legislator “was not even aware that there was a permit process for a sign like this,” as he told a detective. In an attempt to beat the press, so to speak, Kooyenga broke the story himself of the theft with a July 15 press release justifying his actions. It linked to the police report. The Wisconsin State Journal reported the next day that Kooyenga said he released the report because he heard that Rep. Sondy Pope, D-Cross Plains, had been contacted by Johnson for help in getting copies of the police report and video. In her July 17 press release, Pope called Kooyenga out for his “half-hearted apology” and for making “lame excuses for suppressing free speech and theft.” She also criticized the Department of Administration for claiming that release of the video would reveal camera locations and endanger public safety. The Capitol Police is a division within the DOA. The DOA did, in fact, release video of another sign theft in the rotunda. On March 28, 2015, three persons were recorded removing the Freedom From Religion Foundation’s “In Reason We Trust” display. On April 2, an FFRF press release included images from the video. Asked to comment today about taking the sign, Kooyenga declined an offer to talk about pushback to his July 15 statement, instead emailing the same press release he issued then. How did the press do? Generally, it was “one and done” for most media, which seemingly accepted what Pope called “lame excuses” and baseless claims and shifting explanations by Kooyenga, that on closer examination, don’t hold up. The Associated Press did the worst job with a cursory story that bungled badly the sign’s message, instead relying on what Kooyenga said it said. The AP issued a correction two days later that was partially misleading: “A photograph shows the sign actually described President Donald Trump as a groper and referred to all Americans as damned.” It did not say that. It said “and We the People be damned,” which is needed context. No media attempted to interview him that he’s aware of, Johnson said. Kooyenga is seen as a GOP rising star and policy wonk and is vice chair of the powerful Joint Committee on Finance. He touts traditional Republican values of God and country and personal responsibility. He sees himself as a “citizen-legislator,” according to his website. Recently he has said that he’ll decide whether to run against U.S. Sen. Tammy Baldwin after the state budget is finalized. Don Johnson of Madison comes to the Wisconsin Capitol a lot, usually carrying a bag of signs meant to wake people up to the havoc he believes the state, nation and world are being subjected to by Republicans and neoliberal Democrats. Born in Iowa 80 years ago, he’s a soft-spoken Berniecrat who stands 6-foot-3. At age 18 he enlisted in the U.S. Army and ended up being assigned to the Army Security Agency, its signals intelligence branch (motto: Semper Vigilis). The motto is said to echo Thomas Jefferson’s declaration that “The price of freedom is eternal vigilance.” Johnson would agree. After a three-year hitch, two of them spent on the border between East and West Germany, he enrolled at the University of Iowa, eventually earning a B.A. in art and German and an M.A. in design. “On the day I graduated with my first degree, the G.I. Bill was passed and since I had spent most of the past four years washing dishes, I decided the U.S. could pay for my advanced education,” he said. In between studying and scullery, he fell for a woman named Norma. They’ve been married for 55 years. Johnson then taught for five years an Iowa junior college, followed by European stints filming and photographing architecture for use in art history classes and teaching at the Royal Academy of Fine and Applied Arts in The Hague, Netherlands. The signs he often held at the noontime Solidarity Sing Along (now at 1,663 straight weekdays) evolved into larger displays mounted on foam core and placed on a tripod on the Capitol rotunda’s first floor after permits were received. Fliers attached to a tripod and easel summarize the display and invite people to take a copy (but not the whole sign!). WCMC has the best words.